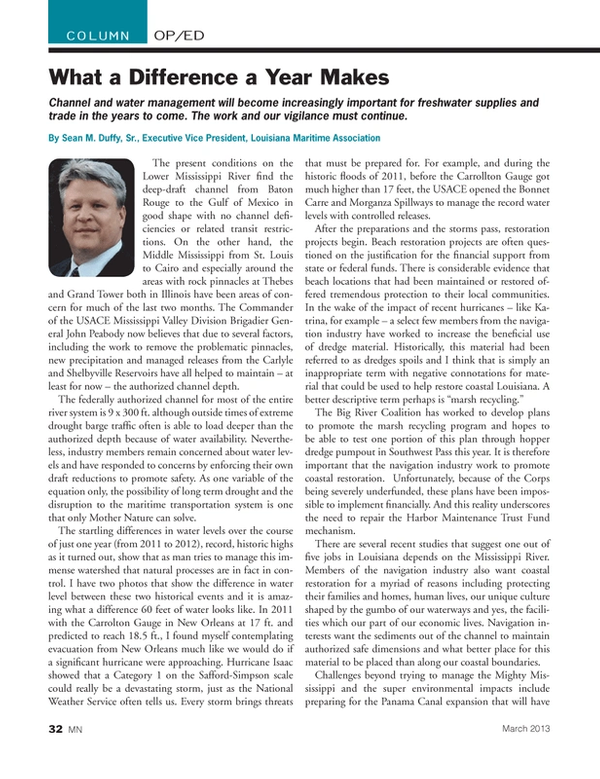 Channel and water management will become increasingly important for freshwater supplies and trade in the years to come. The work and our vigilance must continue. The present conditions on the Lower Mississippi River find the deep-draft channel from Baton Rouge to the Gulf of Mexico in good shape with no channel deficiencies or related transit restrictions. On the other hand, the Middle Mississippi from St. Louis to Cairo and especially around the areas with rock pinnacles at Thebes and Grand Tower both in Illinois have been areas of concern for much of the last two months. The Commander of the USACE Mississippi Valley Division Brigadier General John Peabody now believes that due to several factors, including the work to remove the problematic pinnacles, new precipitation and managed releases from the Carlyle and Shelbyville Reservoirs have all helped to maintain – at least for now – the authorized channel depth. The federally authorized channel for most of the entire river system is 9 x 300 ft. although outside times of extreme drought barge traffic often is able to load deeper than the authorized depth because of water availability. Nevertheless, industry members remain concerned about water levels and have responded to concerns by enforcing their own draft reductions to promote safety. As one variable of the equation only, the possibility of long term drought and the disruption to the maritime transportation system is one that only Mother Nature can solve. The startling differences in water levels over the course of just one year (from 2011 to 2012), record, historic highs as it turned out, show that as man tries to manage this immense watershed that natural processes are in fact in control. I have two photos that show the difference in water level between these two historical events and it is amazing what a difference 60 feet of water looks like. In 2011 with the Carrolton Gauge in New Orleans at 17 ft. and predicted to reach 18.5 ft., I found myself contemplating evacuation from New Orleans much like we would do if a significant hurricane were approaching. Hurricane Isaac showed that a Category 1 on the Safford-Simpson scale could really be a devastating storm, just as the National Weather Service often tells us. Every storm brings threats that must be prepared for. For example, and during the historic floods of 2011, before the Carrollton Gauge got much higher than 17 feet, the USACE opened the Bonnet Carre and Morganza Spillways to manage the record water levels with controlled releases. The Big River Coalition has worked to develop plans to promote the marsh recycling program and hopes to be able to test one portion of this plan through hopper dredge pumpout in Southwest Pass this year. It is therefore important that the navigation industry work to promote coastal restoration. Unfortunately, because of the Corps being severely underfunded, these plans have been impossible to implement financially. And this reality underscores the need to repair the Harbor Maintenance Trust Fund mechanism. There are several recent studies that suggest one out of five jobs in Louisiana depends on the Mississippi River. Members of the navigation industry also want coastal restoration for a myriad of reasons including protecting their families and homes, human lives, our unique culture shaped by the gumbo of our waterways and yes, the facilities which our part of our economic lives. Navigation interests want the sediments out of the channel to maintain authorized safe dimensions and what better place for this material to be placed than along our coastal boundaries. Challenges beyond trying to manage the Mighty Mississippi and the super environmental impacts include preparing for the Panama Canal expansion that will have an undeniable impact on our industry and nation. Many channels are presently undergoing efforts to be deepened to 50 feet. The President’s Task Force on Ports has announced plans to expedite several port deepening projects and I cannot think of a more important channel than the world’s economic superhighway (Mississippi River). The Mississippi River channel was approved for deepening to 55 feet in 1986, but at in the same Water Resources Development Act (WRDA Bill) another section established that all channels deeper than 45 feet would be deepened and maintained with 50% funding from the federal government and 50% from the non-federal sponsor. Because of this overwhelming requirement, the channel was never deepened. In the last year the Big River Coalition has begun working on a compromise to see the channel deepened to 50 feet, a compromise that we hope will allow the channel to be maintained at 50 feet and to develop marsh recycling to help protect our coast. At the same time, advocacy efforts continue from BRC to educate Congress and the administration on the importance on this trade artery and the positive impact on the 31 states it connects to world markets through the Mississippi River Basin. There is no doubt that in the next few decades the channel and water management will become increasingly important for freshwater supplies and trade. As an example, world governments could work to make desalinization affordable and promote this technology. As sea levels rise and glaciers melt, you can argue about the causes, but the future of a civilization that could economically and efficiently convert sea water to fresh water would arguably establish its future in the ever-changing world in which we live. This is of course a long-term goal while deepening the Mississippi River to 50 feet could be done in months. In some quarters, realignment of the Mississippi River channel or delta so that the riverine system would be more naturally able to promote marsh restoration has been proposed. Whether this is a practical matter is far from certain, but it will remain important that navigation interests are embedded with these teams if the concept is brought forward. Changes to this channel have unintended consequences and the threat to the nation’s economy makes this effort one that warrants extreme scrutiny to protect the $120 billion annual impact generated by this channel. Losing the Mississippi River for ship traffic would be a blow to the U.S. economy that it may never recover from and it is important to remember that waterborne commerce is the cheapest, safest and most environmentally friendly mode of transportation.